Visit our showroom to find quality tile flooring designs at an affordable price before you begin your next commercial or residential makeover project. No matter what budget or style you have in mind, our flooring store has a solution for you. If you’re looking to rejuvenate the aesthetic of your home or business while adding to its overall value, then tile floors are a perfect option. They are available in many sizes and colors, are easy to clean, and require minimal maintenance. Regardless of the type of property you intend to renovate, a tile floor is a great way to welcome any guest and make a lasting impression with style and sophistication. Its durability and versatility make it a worthy investment for any area or room, so you can rely on it for an attractive appearance designed to last. 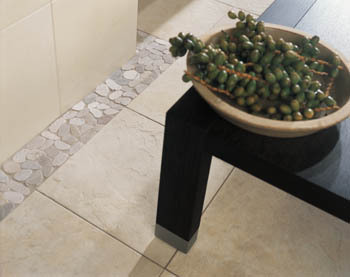 Choose from our selection of slate, porcelain, or ceramic tile. Combined with the option to mix and match patterns, the extensive selection we offer enables you to choose from an unlimited number of design possibilities. You can choose to either match your existing indoor design features or use the tile as a foundation upon which you build the visual style of the rest of your project. With so many options, you are sure to find the floors that perfectly suit your needs in appearance, performance, and price. Choosing tile for your floors is a guaranteed way to create a sense of elegance in any room without having the need to perform constant maintenance. For the areas of your home or business that receive extensive traffic on a daily basis, such as the entrance, kitchen, or bathroom, tile flooring makes an ideal solution for saving time while preserving a classic style. Combined with its simple cleanup ability, tile’s resistance to water and most other stains gives it the advantage you need for ease and enjoyment. Once our staff of flooring experts installs a protective layer of glaze and grout between each of your tiles, your new tile flooring is able to resist any spills that may occur. After our staff of flooring specialists consults with you to determine the most suitable type of tile for your project, we offer you professional tile flooring installation from our experienced crew. Rely on our experienced installers to protect your investment and ensure it looks great and lasts for many years to come. Based on the budget you have set and the vision you have for the overall aesthetic of your commercial or residential property, we help you decide which flooring style would be ideal. By combining these factors with our experience in the industry and your existing interior design, we arrive at a calculated solution that is guaranteed to be the best fit for you. We provide in-home services, as well, so you can simply choose the style you prefer and let us do the rest. Completing the look of your next renovation project is simple with tile floors from our showroom’s large inventory of quality options. Whether you’re looking for a more classic checkerboard design that alternates tile designs or you prefer a singular aesthetic with one color or texture, we have exactly what you need for your project. Our showroom features design options from some of the industry’s top tile floor manufacturers, which means that you can rely on us as your source for quality and style for an affordable price. Contact us for the tile flooring you need for your home or business. We are conveniently located to serve customers in and around Flint, Swartz Creek, Grand Blanc, Davison, and Flushing, MI.